Zion Market Research has published a new report titled “Hybrid Power Systems Market by Type (Solar (PV)-Diesel, Wind-Solar-Diesel, and Others), by Power Rating (Up to 10kW, 11kW–100kW, and Above 100kW), by End-User (Residential, Non-Residential, Rural Facility Electrification, and Others) - Global Industry Perspective, Comprehensive Analysis and Forecast, 2017 – 2024”. 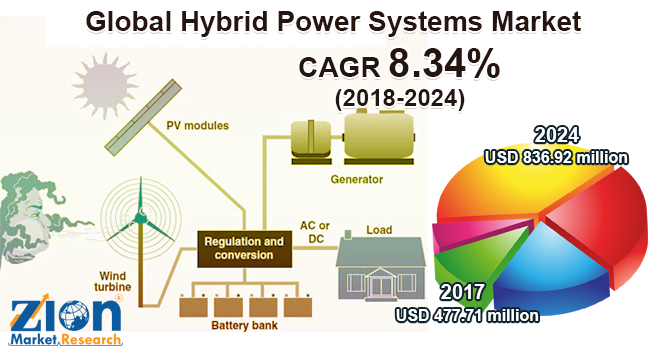 According to the report, global hybrid power systems market was valued at approximately USD 477.71 million in 2017 and is expected to reach approximately USD 836.92 million by 2024, growing at a CAGR of around 8.34% between 2018 and 2024. Increasing popularity of renewable energy sources to produce power has primarily driven the global hybrid power systems market growth. Due to the limited sources of conventional energy and rising environmental pollution concern, numerous companies have been paid attention to the utilization of renewable energy sources such as solar energy, wind energy, fuel cell, etc. Owing to its exceptional characteristics and properties associated with the reduction of carbon emissions, hybrid solutions are gaining significant importance in power generation. Thus, the factor is further expected to boost the demand for hybrid power systems in near future. Hybrid power systems utilize less fuel while providing maximum output. Furthermore, growing awareness about global warming has encouraged the market to shift its focus to the hybrid power system. Moreover, the ability of a hybrid power system to reduce the cost of power generation by cutting the diesel fuel consumption is another major factor that drives the hybrid power systems market across the globe. A hybrid power system is designed to reduce the power generation cost by using natural resources such as river water flow. Additionally, rapid cost increment of fossil fuel and power line extension, coupled with a desire to decrease carbon dioxide emissions encouraged the development of hybrid power system in remote locations. However, a high cost of system installation and investments may restrain the global hybrid power systems market growth. Hybrid power Systems market is segmented based on type, power rating, end-user, and region. Type segment included in this market are solar (PV)-diesel, wind-solar-diesel, and others. Power rating segment includes up to 10kW, 11kW–100kW, and above 100kW. The end-user segment includes residential, non-residential, rural facility electrification, and others. The regional segmentation includes the current and forecast demand for North America, Europe, Asia Pacific, Latin America, and the Middle East and Africa with its further bifurcation into major countries including the U.S., France, the UK, Germany, China, India, Japan, and Brazil. Key players profiled in the global hybrid power systems market include Siemens AG, SMA Solar Technology AG, Danvest Energy A/S, Alpha Power Solutions, ZTE Corporation, Heliocentris Energy Solutions AG, Poweroasis Ltd., Flexenclosure AB, Ltd., Pfisterer Holding AG, and Vergnet SA.